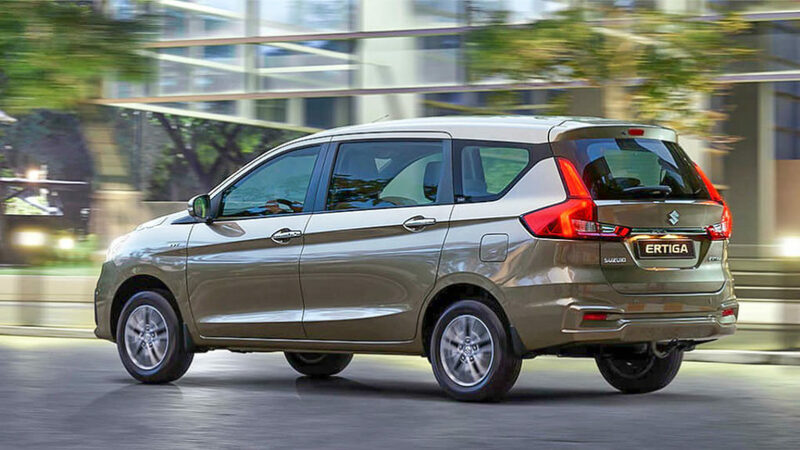 Maruti Suzuki introduced second-generation of Ertiga late last year and it comes in four variants – L, V, Z and Z+. The new Ertiga is loaded with features even from base variant onwards. The exterior features include projector headlamps (Halogen), 3D Tail Lamps with LED, painted front grille and steel wheels. The interior comes with manual AC, Air Cooled Twin Cup Holder (Console), Accessory Socket Front Row with smartphone storage space, power windows, power and tilt steering, bottle holders, cabin lamp, dual tone colour theme, 60:40 second row seats with reclining function, third row 50:50 seats, headrests (1st, 2nd and 3rd row) and driver side Sun-visor with ticket holder. The instrument cluster on the base model gets MID with Coloured TFT, Tachometer, Gear Shift Indicator, Digital Clock, Fuel Consumption, Distance To Empty, Headlamp on Warning and Door Ajar Warning Lamp. Maruti Suzuki has also given new technologies like Idle Start Strip, Brake Energy Regeneration and Torque Assist during Acceleration as standard. The Ertiga is loaded with safety features from L variant onwards and it includes dual airbags, ABS with EBD, Brake Assist, ISOFIX Child Seat Anchorages (2nd row), Front Seat Belts with Pre-tensioner and Force Limiters, Seat Belt Reminder Lamp with Buzzer, Speed Sensitive Auto Door Lock, Rear Parking Sensors, Central Locking and High-Speed Alert System. 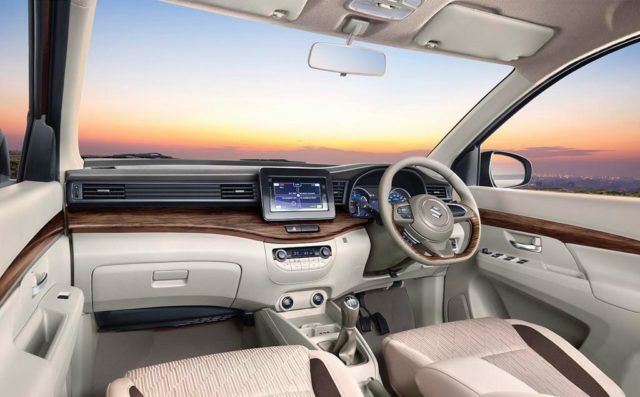 The company has increased the dimension of new Ertiga to improve cabin space and the MPV comes with 209 L of boot space with all three rows up. By folding down the third row, it can be increased to 550 L and 803 L by folding the second row. 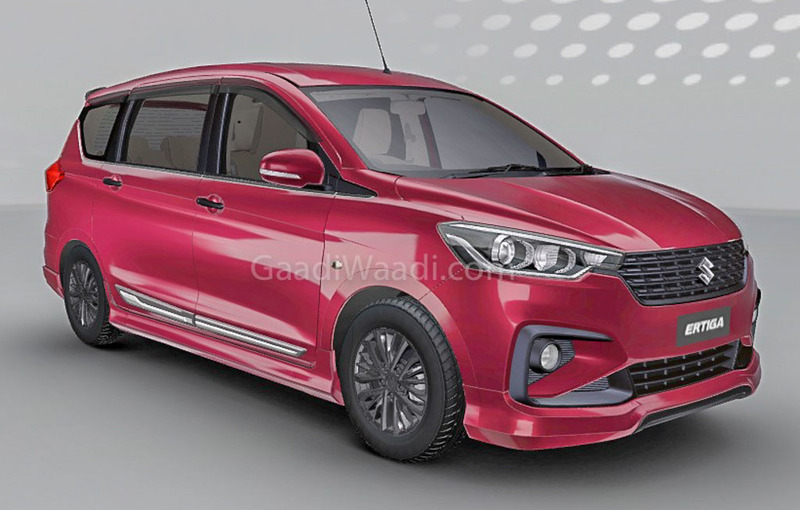 The wheelbase of Ertiga is 2740 mm and the turning radius is 5.2 m. The second generation model is based on the Heartect platform like most of the new generation Maruti models. The Ertiga is powered by newly developed 1.5 L petrol engine with SHVS and this engine made its debut in Ciaz. The 1.5 L engine puts out 105 PS and 138 Nm, mated to 5-speed manual and 4-speed Auto. The diesel engine is the same 1.3 L unit from the earlier model with 89 PS and 200 Nm, mated to 5-speed manual gearbox only.